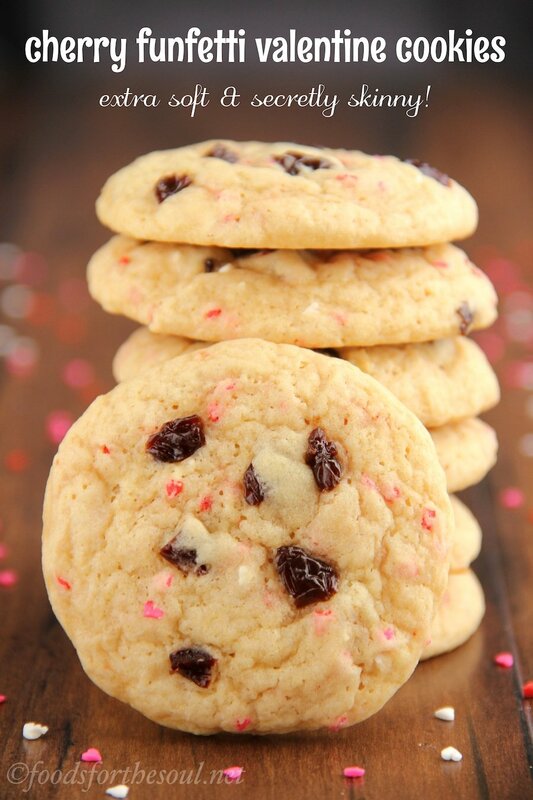 Soft & chewy cookies perfect for Christmas or Valentine’s Day! With the ideal balance of chocolate & vanilla, these irresistible treats will barely last a day in your house! This past Black Friday, my guy bought us a brand new TV. The back-story is a tale for another day (it involves four stores, two TVs, and one very sleepless night for him), but the end result was that we now essentially have a computer with a huge screen in our living room. Yes, a computer. Apparently, it isn’t enough for a TV to turn off, on, and play DVDs anymore because this one came with apps, just like on my iPhone: Hulu, Target, YouTube, MLB.com (I can’t wait until April to use that one! ), and more. But so far, our favorite has been Netflix. Quite a few times each season, one of the contestants bakes red velvet cupcakes as one of their four flavors, and nearly every time, Florian, the French judge, despites it. As a very particular person with a highly refined palate, he remarks that they’re too vanilla-y without enough cocoa, unnaturally bright red, too doughy, too dense, too tough… All with a classic thick French accent. 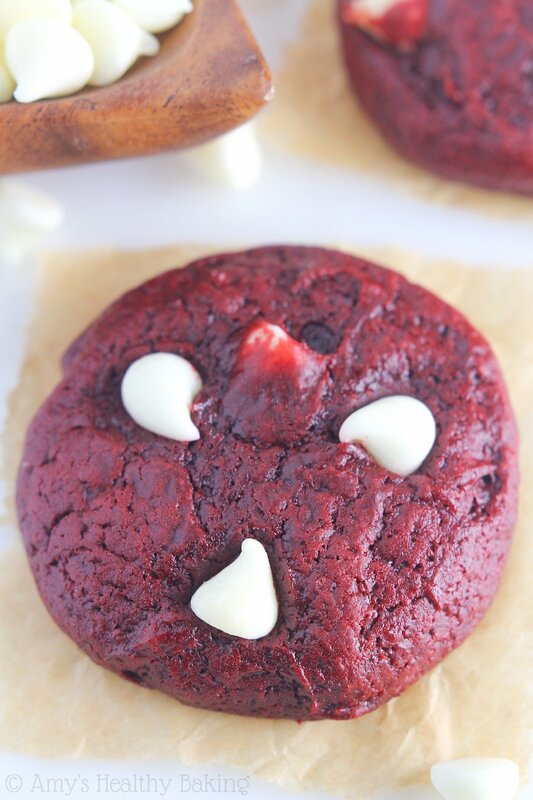 Almost nobody has earned a red velvet approval from Florian! 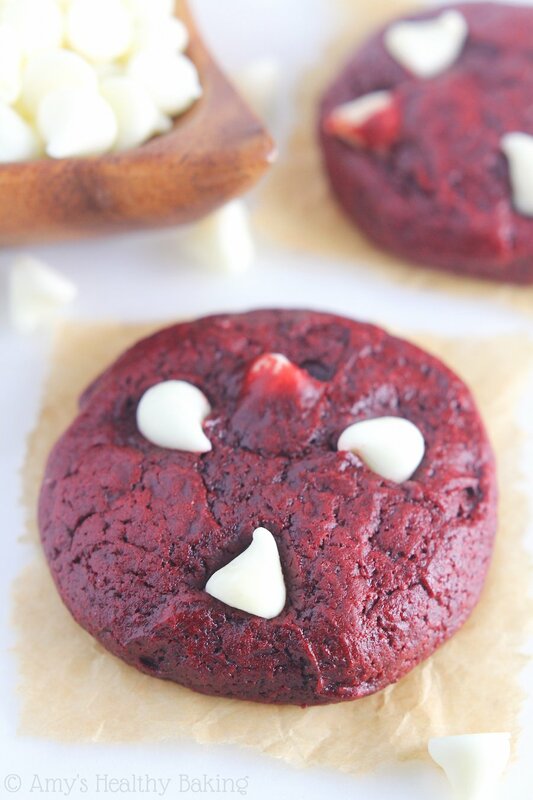 Yet even with all of those warnings playing on the TV in the background, I still decided to bake these White Chocolate Red Velvet Cookies for Valentine’s Day. With how they turned out, I’d actually be proud to present them to Florian! 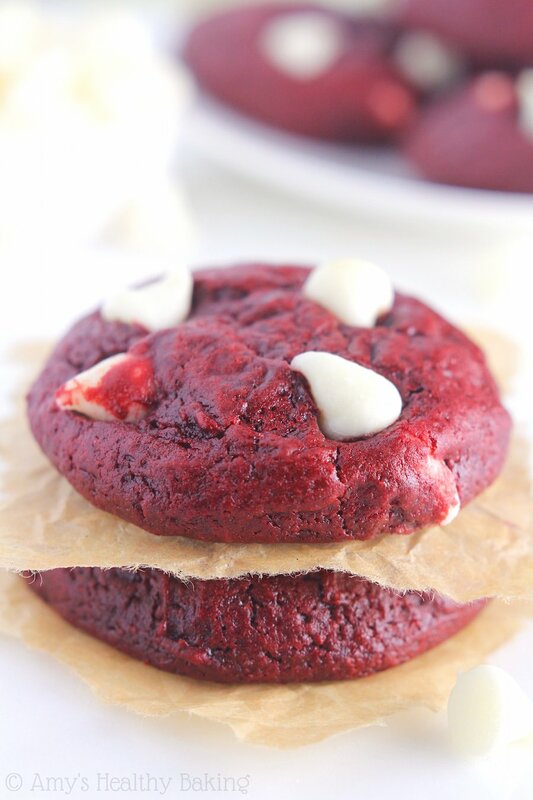 Soft and chewy, deep brick red, and with a strong hint of cocoa, they’re as close to perfection as red velvet cookies can come. Before we start mixing up the dough, there are two very important ingredients in this recipe. 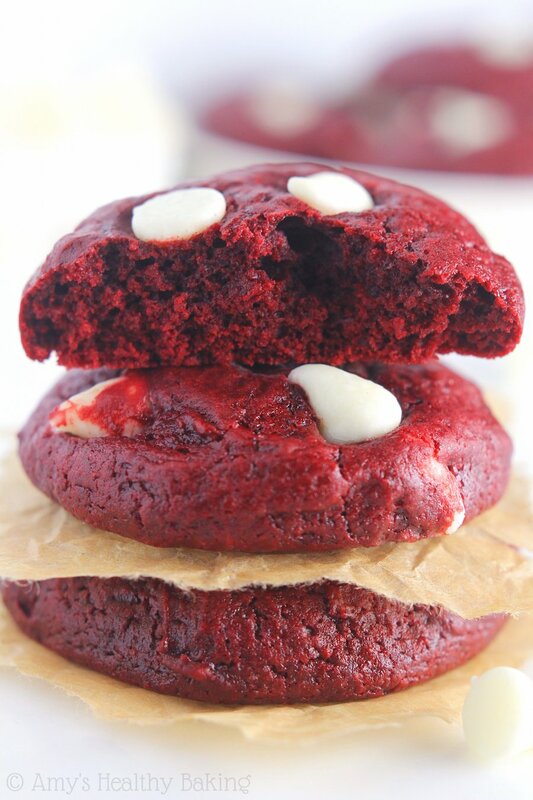 1) Red food coloring. 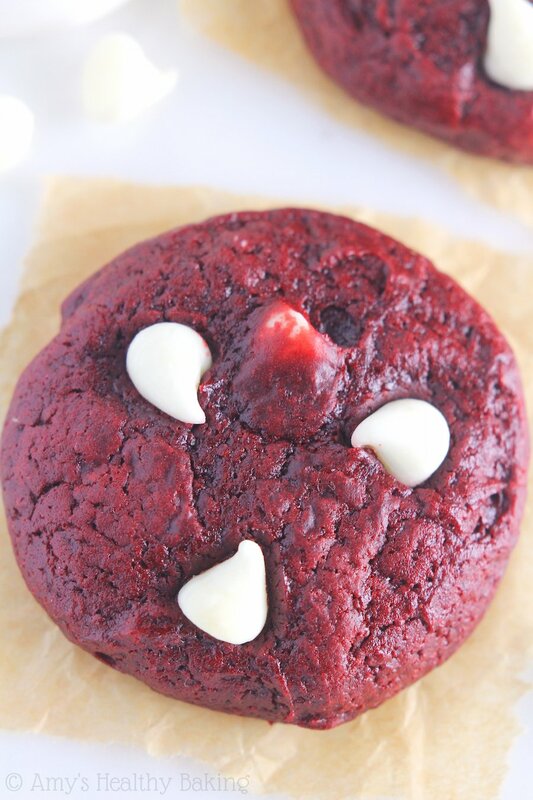 It wouldn’t be red velvet without it! Buy the larger bottles sold individually on the baking aisle. Don’t use the tiny dropper bottles; they don’t contain nearly enough liquid to tint these cookies. 2) Cornstarch. 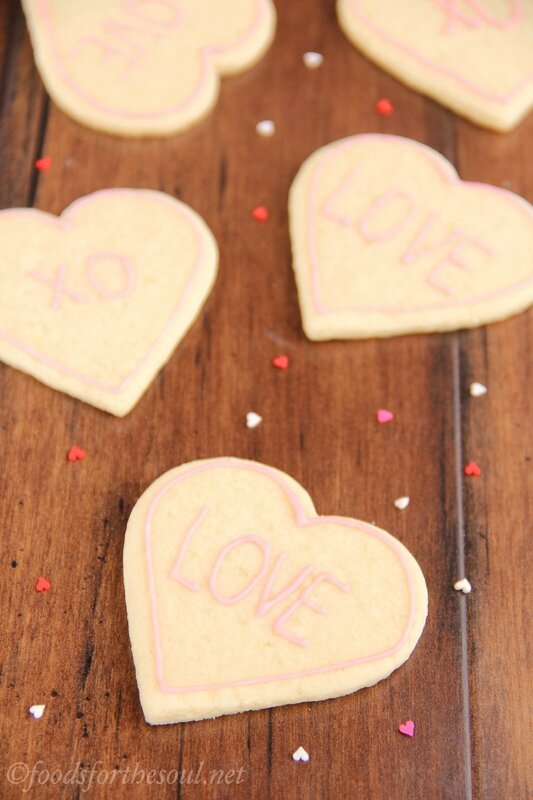 It sounds like a strange ingredient for cookies, but trust me on this! Cornstarch makes the cookies extremely soft by soaking up additional moisture from the dough, and they’ll stay that soft for an entire week. 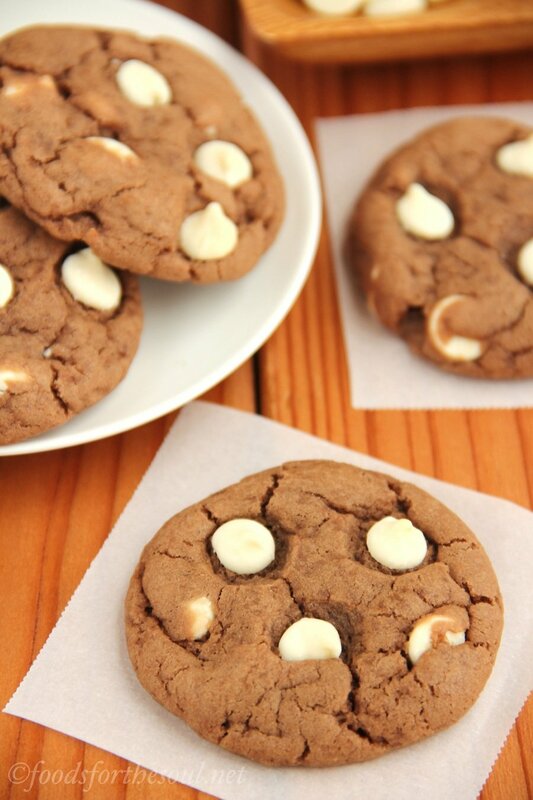 With a plethora of white chocolate chips, the flavor balanced perfectly. 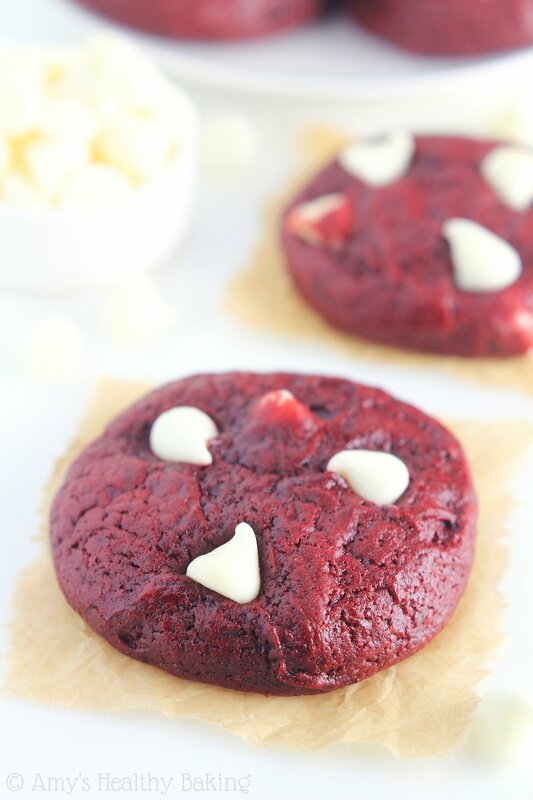 The white chocolate added the extra oomph of vanilla that a classic red velvet flavor requires. And even though I’m normally not a huge fan of white chocolate, I couldn’t stop myself from sneaking cookie after cookie after cookie! Somehow, I think Florian may have done the same thing too. These gorgeous cookies have the perfect flavor balance of chocolate in the cookie dough and vanilla from the white chocolate chips. They’ll stay soft & chewy for an entire week when stored in an airtight container—if they last that long! Whisk together the flour, cocoa powder, cornstarch, baking powder, and salt in a medium bowl. In a separate bowl, whisk together the butter, egg, and vanilla. Stir in the brown sugar, smearing out any clumps along the side of the bowl. Carefully stir in the red food coloring. Add in the flour mixture, stirring just until incorporated. Fold in 2 tablespoons of white chocolate chips. Drop the cookie dough into 12 rounded scoops onto the prepared baking sheet, and flatten to about half their height. Press the remaining white chocolate chips into the tops. Bake at 350°F for 10-12 minutes. Cool on the pan for 5 minutes before turning out onto a wire rack. Notes: On the baking aisle, there should be large bottles of red food coloring sold individually. Do not use the tiny dropper bottles; they don’t contain enough food coloring. Be careful when adding the food coloring; it stains clothes easily! This recipe is easily doubled or tripled to serve more. Hi! Can I use whole wheat pastry flour? I’m ready to make these!